‘Jewellery for the home’ is how Slovenian jewellery designer Lara Bohinc describes her venture into furniture, lighting and accessories. Having wowed the fashion intelligentsia with her delicate filigree jewellery designs since graduating from London's Royal College of Art in 1997, Bohinc is having the same effect on the world of interiors. So much so that she launched Bohinc Studio in 2016 to continue her foray into homewares and has now opened a new showroom in West London to share the results. Set on the ground floor of a Grade II-listed townhouse, it's the perfect setting to view her elegant marble, brass, glass and ceramic collections, backdropped by period cornicing and bold geometric-patterned marble floors. 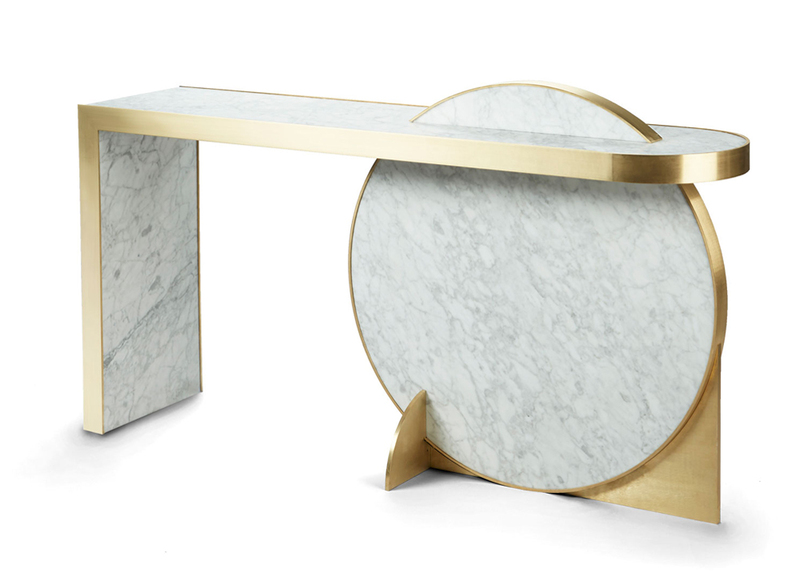 Bohinc’s first furniture design the rotating marble-and-brass ‘Solaris Kinetic Table’, part of the 'Lunar Collection' for Lapicida, can be seen here but we’re particularly taken with the new ‘Collision Console’ table, also for the luxe UK stone specialist. A star piece in her chic showroom, the simple geometric shape echoes Bohinc’s jewellery, albeit on a much larger scale. Also on show is the ‘Fortress’ collection of ceramic vases, inspired by octagonal towers at Diocletian's Palace in Split, Croatia, sinuous Murano glass 'Venturi' vases, and the deconstructed gold-and-white ceiling and table lights from the ‘Collision’ series.